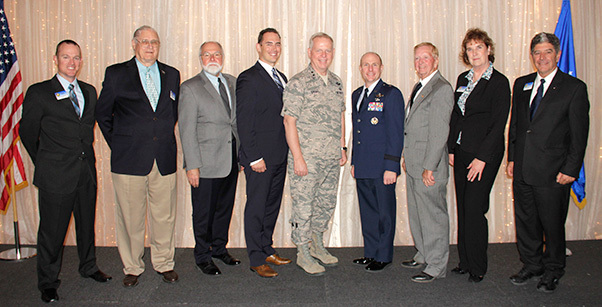 The Edwards AFB Civilian-Military Support Group held its 2015 Installation of Officers and Directors Oct. 9, where Brig. Gen. Carl E. Schaefer, 412 Test Wing commander, swore in the incoming officers and directors for the 2015-2016 fiscal year. Officers: President, John A. Fergione; Vice President, Mark E. Thompson; Secretary, Matthew C. Winheim; and Treasurer, George A. “Bud” Reams. Directors: George E. Nagy, Rhonda J. Nelson, David R. Norris, Robert Slade, Mark E. Thompson, Leslie S. Uhazy and Matthew C. Winheim. Founded 26 years ago by Aida O’ Connor, the general nature of the group is to establish a friendly benevolent association of civic leaders and military personnel and to act as a host group whenever needed. They also consider an annual service project to benefit Edwards AFB. “My number one goal for next year is to beat the $29,400 plus that we donated in direct support of Edwards last year and while doing so, I also hope to take our administrative expenses to an all-time low. I also intend to have fun in the process,” said Fergione who also presided as the master of ceremonies. 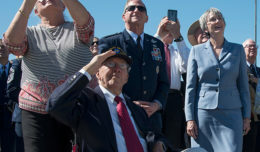 Funds donated to Edwards AFB are used for a number of programs such as the Edwards Emergency Relief Fund which is managed by the Edwards First Sergeants’ Council and provides financial assistance to servicemen for a variety of reasons. Part of the EERF is the Holiday Meal Program, which provides gift baskets to military families during the holiday season. The Angel Tree program insures that each child will have a gift on Christmas as well. Last month the group donated $2,000 to Hearts-Apart, a program designed to help families when their spouses are deployed. The group also purchased tickets for veterans for community events. After spending a week at “General’s charm school” in Washington, D.C., a few months ago, Schaefer said that the conversations throughout the week often included Civ-Mil groups at the officer’s bases. Sharing a “war story” of flying F-15 Strike Eagles over Kosovo and pushing into “bad-guy-land” along with 30 to 40 other aircraft, Schaefer said that as the ground was lighting up beneath him, he had to trust that he was up far enough not to be shot down. 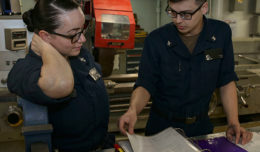 The Unsung Hero Award, granted annually to the member who went above-and-beyond in offering their time (with little recognition) towards the advancement of the Mission of the Edwards AFB Civ-Mil Support Group, went to Diane Nagy for her untiring efforts on the Historical Committee and pushing the 25-Year Historical Book to its completion. For more information or to become a member, visit www.eafbcivmil.org.